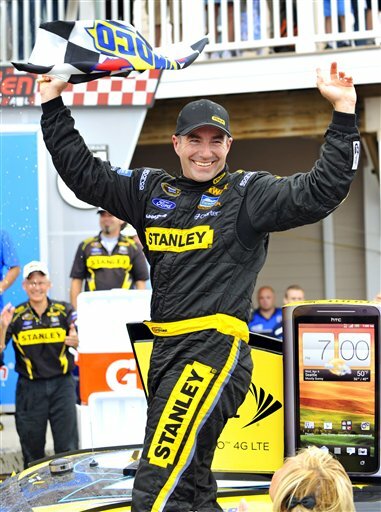 WATKINS GLEN, N.Y. (AP) — Slipping and sliding around oil-spattered Watkins Glen International on the last lap and fighting for the lead, Marcos Ambrose and Brad Keselowski didn’t know what lay around the next turn. It didn’t for Busch, who led 43 laps. Desperate for a win to move back into contention for the Chase for the Sprint Cup championship, Busch skidded sideways coming out of the first turn of the final lap. Keselowski’s No. 2 Dodge caromed off the side of Busch heading uphill through the high-speed esses and Ambrose followed Keselowski through as Busch spun to the side. Ambrose slipped again in turn 10, but Keselowski couldn’t drive past. Neither gave ground, and Ambrose forged ahead on the final turn, another hard right-hander, and turned away Keselowski’s final charge on the outside. Jimmie Johnson was third to gain the points lead by one over Greg Biffle. Sonoma winner Clint Bowyer and Sam Hornish Jr. were next, giving Dodge, which is leaving NASCAR at season’s end, two in the top five. Dale Earnhardt Jr. spun late and finished 28th to fall from first to fourth in points, 17 behind Johnson. The top 10 drivers in the standings qualify for the 10-race Chase, and two wild cards are awarded to the drivers with the most wins outside the top 10 — provided they finishing 20th or higher in points.